When running for the Illinois Senate against Steven Douglas, Abraham Lincoln gave his famous “A house divided cannot stand” speech. Lincoln went on to lose the Senate race, but his opinions put him in the national spotlight for his anti-slavery views and would land him the newly formed Republican Party’s presidential nomination. At the same time, the Democratic Party was in shambles, and the irony of Lincoln’s “house divided” speech rang true with the Democrats. In the election of 1860, the Democratic Party was divided over the issue of slavery. The party split into Northern Democrats and Southern Democrats, each holding their own National Convention and running their own candidate against Lincoln. In Meigs County, Democrats were feeling the strain and some decided to leave the party altogether over the issue of slavery and take up the banner of the GOP. In the July 17, 1860, edition of The Pomeroy Weekly Telegraph, two stories ran discussing the political climate in Meigs County. 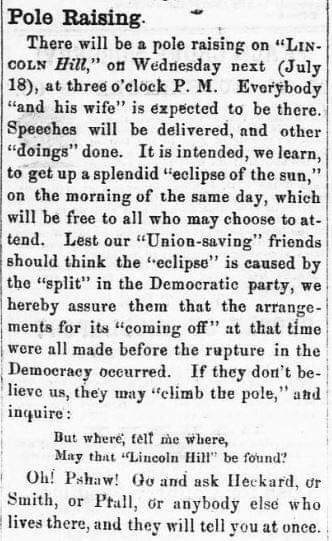 In last week’s Telegraph we announced a meeting for Thursday night, at which Mr. William Dilcher would give a “farewell address to the Democratic party.” – With the evening, came such a crowd as is seldom called together in Pomeroy. The “stars and stripes” waved, the band discoursed patriotic music and the citizens crowded the Court House to its upmost capacity. Judge Heckard was appointed Chairman, and on calling the meeting to order, introduced Mr. Dilcher who addressed the audience for about an hour. He was received with great applause, and was frequently cheered during the progress of his speech. He spoke in the English language, and not being perfectly master of it, was not, perhaps as fluent and forcible as if he had used his own native German. But he made himself well understood, and gave some capital hits which brought down the house. He gave his reasons for leaving the Democracy and joining the Republican party, in a kind and conciliatory manner, that ought not to have offended any of his former political associates. Many of them will go with him and cordially support the Republican ticket. Many will vote one or the other of the Democratic tickets “once more” under the honest, but mistaken belief that they are subserving the cause of freedom and right by so doing, and some, the mere partisans who are governed by prejudice and will not reason, will denounce Mr. Dilcher as a “turn coat,” and think they have hereby disposed of him and his arguments. Mr. Dilcher, in conclusion invited any Democrat present to reply. Upon this a call was made for Mr. Wallar, of Racine who has been one of the most prominent and intelligent Democrats of this county. The Douglas Men called vociferously for Mr. Wallar, but this gentleman did not appear, until the Chairman requested him, if present, to come upon the stand. Upon this appeal Mr. Wallar came forward, and was received with tremendous applause, especially by the Democratic part of the audience. But here, the speaker showed that “he had come to a point where he must do one of two things – either, give up his long cherished sentiments, and go with the remnant of the party in their present pro-slavery position, or cast his lot with the Republicans. After mature consideration, he was constrained in fidelity to his principles, the clearest conclusions of his judgment, the dictates of his conscience, and in view of the best and highest interests of his country, to unite with the great Republican party and give it his influence, his voice and his vote.” We could not distinguish the voices of our Democratic friends in the cheering which followed this announcement. But there was grand cheering, nevertheless. We have not time to give even an outline of Mr. Wallar’s speech. But we are sure that everyone in that large audience will agree with us that for courteousness of treatment to former political associates – clearness of argument – beauty of language – and effective deliverage, the speech was rarely surpassed in that house. We do not know that Mr. Wallar has been much in the habit of public speaking, but hope he will find time to let his fellow citizens hear from him on the stump, during this campaign. The meeting, we think, will result in much good. The Pomeroy Weekly Telegraph’s second article, “Pole Raising,” went on to give its readers information of a pole raising on “Lincoln Hill,”originally named Heckard’s Hill for Martin Heckard, Meigs County’s first Probate Judge. May that “Lincoln Hill” be found? Oh! Pshaw! Go ask Heckard, or Smith, or Prall, or anybody else who lives there, ​and they will tell you at once. A very dirty business has occurred on Lincoln Hill on Rutland Road. Those who have passed by will remember the beautiful pole erected there some weeks ago by the Republicans. 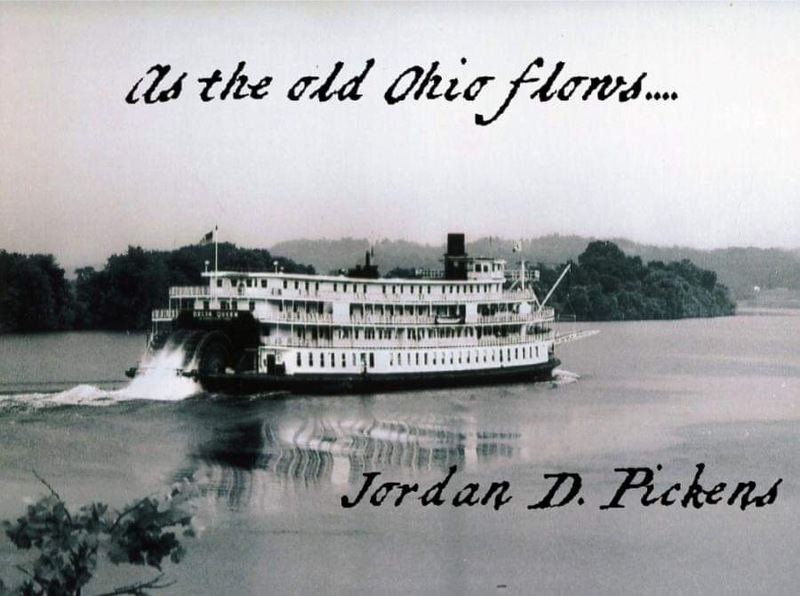 It was one of the finest poles ever erected in the county and with its beautiful flag and streamer, could be seen miles up and down the Ohio River. It is the practice of all parties to raise these poles and is never looked upon as an offense but there are some parties, little, dirty, mean, night prowling, petty rascals, and sneaky villains performed the feat of boring down this beautiful pole. They destroyed property they could not steal and they also had the cowards instincts by boring it down and fleeing in such a way that they left their tools behind.